One hundred years ago, considerable tonnage could navigate the North Channel, as far as St. Patrick’s Bridge, and on the South Channel as far as Parliament Bridge. St. Patrick’s Bridge and Merchants’ Quay were the busiest areas, being almost lined daily with shipping. Near the extremity of the former on Penrose Quay was situated the splendid building of the Cork Steamship Company, whose boats loaded and discharged their alongside the quay. 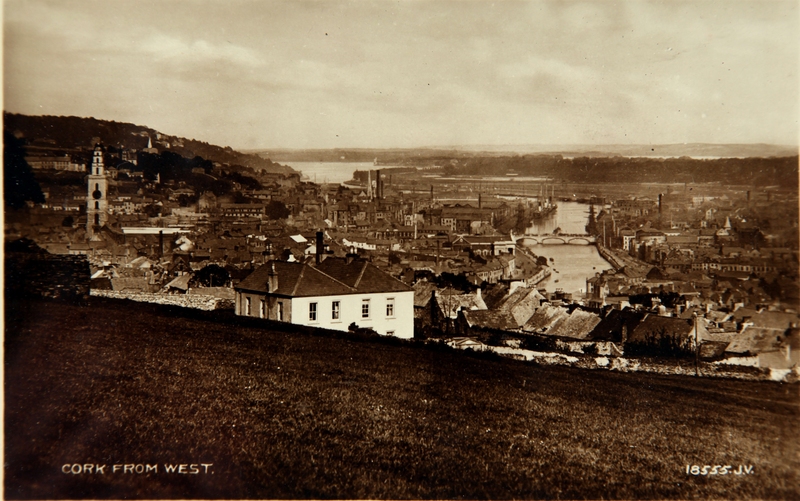 In the late 1800s, the port of Cork was the leading commercial port of Ireland. The export of pickled pork, bacon, butter, corn, porter, and spirits was considerable. The manufactures of the city were brewing, distilling and coach-building, which were all carried on extensively. The imports in the late nineteenth century consisted of maize and wheat from various ports of Europe and America; timber, from Canada and the Baltic; fish, from Newfoundland and Labrador regions. Bark, valonia, shumac, brimstone, sweet oil, raisins, currants, lemons, oranges and other fruit, wine, salt, marble were imported from the Mediterranean; tallow, hemp, flaxseed from St. Petersburg, Rig and Archangel; sugar from the West Indies; tea from China, and coal and slate from Wales. Of the latter, corn and timber were imported in large numbers. In December 1920, six unknown I.R.A men ambushed auxiliaries within a hundred metres of the central military barracks near Dillion’s Cross in Cork City. Victoria Barracks named after Queen Victoria was originally built in 1806. During the 1920 ambush, empty lorries used to transport auxiliaries were bombed and auxiliaries themselves were raked with revolver fire. At least one auxiliary was killed and twelve others were wounded. In retaliation, indiscriminate shooting commenced by the auxiliaries and Black and Tans in the main city centre streets shortly after 8 o’clock. Curfew was at ten o’clock but long before that the streets became deserted. At ten o’clock two houses were set alight by the ‘Tans’ at Dillion’s Cross and the adjacent roads were patrolled to prevent any extinquishing of the flames. Soon, petrol was brought into the city centre and various premises at random were set alight. There was no distinquishing between Loyalist and Nationalist premises. The fires spread rapidly and soon most of the eastern portion of St. Patrick’s Street was blazing. In addition, the City Hall and the city’s Carnegie Library were destroyed. It was these fires that destroyed large portions of Cork’s public and historic records. The complete gutting of the St. Patrick’s Street led to a full reconstruction within ten years and a new City Hall was only built in the early 1930s, which was opened by Eamonn de Valera in 1936.